Multipurpose stadium with Viewing Gallery and artificial Truf & athletic outdoor stadium will replace the present Rajiv Gandhi stadium. In order to give a boost to sports activities in Capital complex , the state govt is decided to facelift the present Rajiv Gandhi Stadium here at Naharalugn with a new multi-purpose stadium . The executing agency, Urban Development department already started the dismantling of the boundary wall of the present stadium. 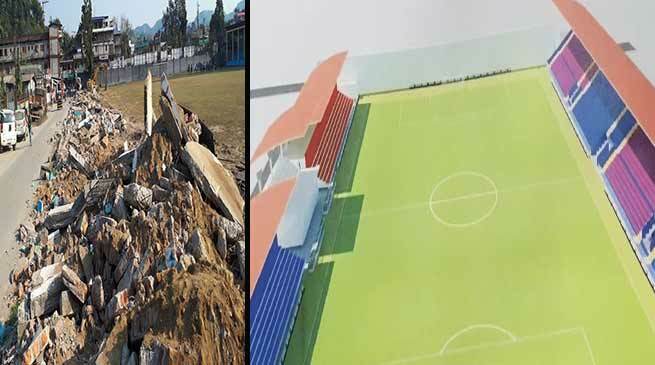 Director Sports Tadar Apa when contacted said that there is a proposal for complete renovation of present stadium which was approved in last year which is being done by Urban Development department. Apa inform that the government is working on the development of sports infrastructure across the State. The main vision is to make Arunachal Pradesh a vibrant leading edge state in sports arena through target oriented action plans and promote the State Sports Associations and the State Olympic Association for diverse activities including coaching, training, counselling and participation at various levels of tournament and championships of all sports disciplines. It aims that by the year 2030 the basic pre-requisite need of infrastructure and necessary technical back-up for development of sports and youth activities will be fulfilled in all Districts, Sub-Divisions and block headquarters. Apa added. However Director UD Tarang said that due to some technical problem the starting of work delayed for few months and now the work began and hope that the stadium would be a beautiful infrastructure and an asset for the people and sports lovers. Urban Development Itanagar Division Executive Engineer Gyamar Tachung inform that the estimate was framed by UD Department amounting to Rupees Fifteen Crore which was approved and sanctioned last year. The tender process have already been done and work have been started and hope that a beautiful infrastructure is completed soon for the promotion of games and sport and other activities. Briefing about the project Executive Engineer Tachung said that The new project shall have additional gallery to increase the seating capacity, providing car parking at gallery basement at IMC office end, Turfing play ground with artificial turf, Drainage system and by providing other utilities like changing rooms, medical room, administrative room, toilets and some retrofitting works in certain existing structures. On up gradation, stadium shall accommodate seating capacity of 15,000 spectators, apart from accommodation for players and supporting staff, the scope of the project is to provide space for outdoor & indoor activities and public amenity areas as well, like spaces and amenities for players, spectators, permanent admin staff, VIP, press media, medical room facilities for players & car parking facilities. The Turfing highly artificial turfing shall replace the dilapidated uneven natural play ground grass to provide evenly and excellent play ground to ensure quality of the ground, well designed and panned drainage system. The total site area will be 59,585 sq mtrs whereas at present area under stadium is .28,060 sqmtrs while open area outside stadium construction is 31,525 sq mtrs and stadium ground area (Play field) is 18,232 sq mtrs. Tachung added. When asked about the available infrastructure for sports apart of SAI and SLSA, Darang said that Sports in the modern era have attained the status of an industry, which no state can neglect if it has to carve a niche for itself in a competitive world.